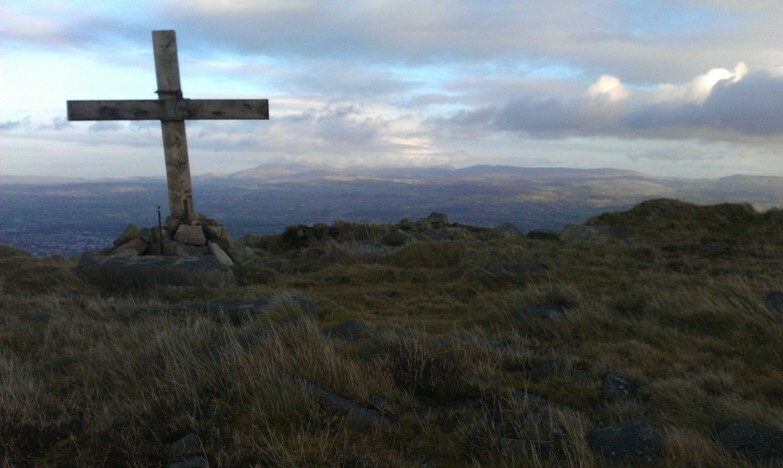 Relatively recent history has liberated Camlough Mountain from the bonds of the military: some metallic paraphernalia remains high on its slopes but if one puts that aside it's a cracking little eminence set in splendid country. Start from the minor road across the hill's southern flank at (054 239 A); a couple of cars can be cautiously slipped onto verges hereabouts. Follow the road (locked gate, so no vehicular access) leading straight into the forest: once under the leafy canopy it darts back and forth drunkenly in an attempt to mitigate the steepness of the slope. Just below the level of the conspicuous masts (at roughly (056 246 B) ) there is what looks like a large parking area on the left; at this point take a wide track also on the left that almost doubles back on the road. This soon bends round to meet the masts, and if you hug the right hand side of the first enclosure a track of sorts can be picked up heading towards the summit, clearly visible across a bit of a dip.